Top cycling photographer Graham Watson takes us through his favourite moments of the 2013, as captured on his camera. Arnold Jeannesson’s big leg-stretch before a stage of the Tour of Oman wasn’t just a nice shot, it also reveals a little of what goes on aboard a team bus – when there is a team bus! Races like Oman, Qatar, Beijing and the Tour Down Under allow the public to see a bit more of the stars before and after the racing. Now that’s not a bad thing. Fabian Cancellara’s win in Paris-Roubaix was extremely popular as it made up for his bad luck in 2012 and gave the fans so much to be happy about. Stage three of the Tour was the most stunning in the whole race, with this canyon above the Gulf of Porto being the striking highlight. The buses that follow most Tour stages usually spoil the views, but in Corsica any such vehicles were nowhere to be seen. An embarrassed Richie Porte laughs as he descends the Col de la Peyresourde, heading for a 20-minute loss on stage nine of the TdF. 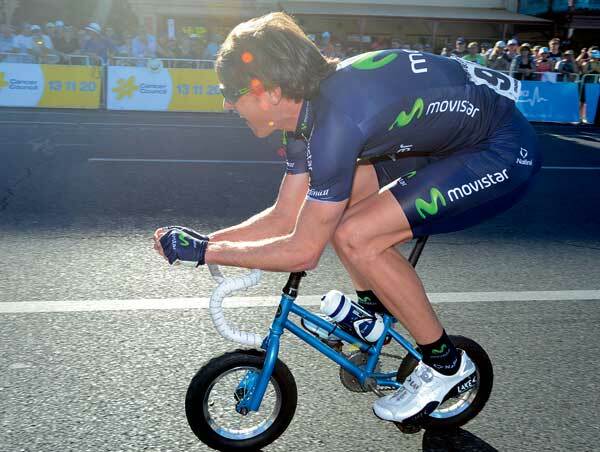 The former powerhouse time triallist José Ivan Gutierrez amuses the crowds in Adelaide ahead of the first race of 2013. I rate Chris Froome’s win on stage 17 of the Tour as his best performance of 2013. This was a highly technical TT on narrow, twisting roads, and although he didn’t need to race it flat-out, Froome took on all the risks of crashing to open up his lead on GC. Bravo! Mechanic Craig Geater gave me a great image to capture as he appears to dance away from his rescued rider on the last stage of the Tour of Oman. It’s the shadows that make the image so funny, but nothing can actually show how quickly a mechanic like Craig does his job – in just seconds! The Gulpenerberg is the most accessible hill for spectators to watch the Amstel Gold Race each year. I return here each year – unfortunately, followed by most of my colleagues looking to copy the same shot. The shot of Pat McQuaid congratulating Brian Cookson after the UCI Congress in September is unique – because no one else was allowed in with a camera! The moment was gone in just two seconds, yet its importance in the sport might last for many, many years, not least because of the build-up to the highly contested election. Stage 16 of the Tour took the race along a spectacular gorge, one that I had not seen since a stage of Paris-Nice almost 15 years ago. That’s the beauty of France for you, something new and surprising every day. A passing cloud slightly spoiled my efforts as the peloton entered a small tunnel, but the image is still satisfying enough. Philippe Gilbert and Taylor Phinney amuse the crowds at the sign-on before the icy-cold Ghent-Wevelgem. It was so cold in fact, the first 50km were neutralised. 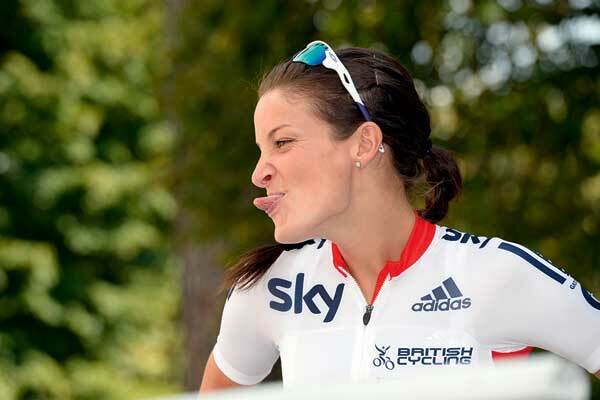 If I ever get to actually meet Lizzie Armitstead, I owe her an apology for this sign-on shot before the Florence World Champs. When Lizzie jokingly poked her tongue out at a team-mate, I was in the right place at the right time! I enjoyed seeing Chris Horner win the Vuelta, not least because he always wears a smile on his face instead of a grimace! But will he still be smiling in 2014? The Tour of Oman allows people like me to enjoy a very beautiful country, just days after the monotony of the Qatari desert. Here the peloton is racing towards a finale at Green Mountain, and I was lucky enough to be in front by about 10 minutes and see the potential for this spectacular image, one that required hiding the motorbike behind some rocks so no other photographers would see us! The sport needs a showman like Peter Sagan, who pulled off this wheelie while winning Ghent-Wevelgem. 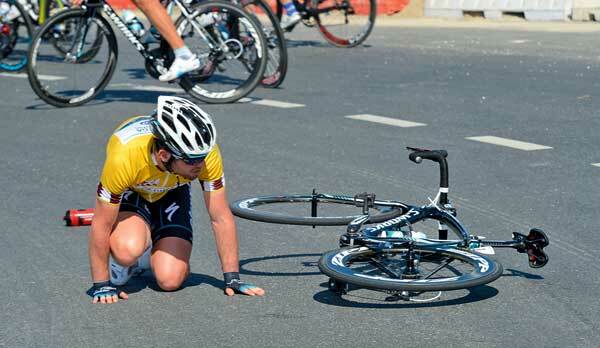 You never know what to expect from Sagan, and I have no doubt he has a few more surprises in store for us in 2014. Tony Martin has become the best time triallist of his generation, and it’s so nice to see him in the world champion’s rainbow colours so often. I’m spoilt for choice on my favourite shot of him from 2013, but I particularly like this one of him winning the final stage of the Tour of Romandy. Alex Dowsett made sure to brighten up a rainy day for me in the Giro. I love working in the rain, but shots like this make my life just a little more fun on a day when the cameras are almost certain to stop working at any point. 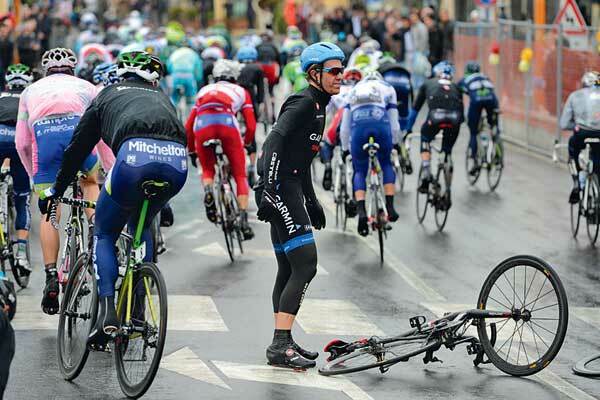 Tyler Farrar crashed in the finale of Milan-San Remo, and even from a fair distance I could hear his cursing and swearing as another chance slipped away. The pressure is on this young man in 2014. On a rare pedestrian stage of the Tour, I got a lucky shot as the peloton entered a Provençal town on its way to Montpellier. It’s the spectators and their shadows that save this otherwise ordinary image, because the peloton was going really slowly! It was hard to take a shot of so much rain at the World Champs as I was laughing so much! I think the 2013 Worlds was my wettest day ever, worse than the 2010 Giro, but there are great photos to be had. Cyclists ankle-deep in water are a scarce commodity. Aside from the amusement of the panda chasing Dan Martin and Joaquim Rodriguez in Liège-Bastogne-Liège, a thorny question arises: how much longer can fans be allowed to run out like this? It makes for great images, but an accident surely awaits. I felt so sorry for Bradley Wiggins on stage seven of the Giro. He was cold, in shock from a fall, and had the world’s media following his every move on a descent into Pescara. Anyone else could have suffered anonymously, but not a Tour de France and Olympic champion so obviously out of sorts that day. I see that day as a career-changing moment for Wiggins, at least when he’s Grand Tour stage racing. Chris Froome won so many fans with the way he raced and won the Tour in July. On the bike, and off the bike, Froome won people over, and not least the family of Joaquim Rodriguez, whose kids he greeted so warmly on the podium in Paris. I’ve managed to capture the moment when Fabian Cancellara started the winning move in Paris-Roubaix. I was the last one to think he could then outsprint Vanmarcke in the stadium, but I was delighted that he won! Marcel Kittel could possibly be the world’s fastest sprinter, and here he and André Greipel fight to win stage 10 of the Tour – talk about two careers turning on a sprint! Mark Cavendish crashed on the final stage of the Tour of Qatar, and the whole peloton waited for the race leader before starting to race again, a huge sign of regard in an age infamous for its lack of respect. And, of course, Cavendish duly won the stage too! I got some great descending shots on stage 16 of the Tour. 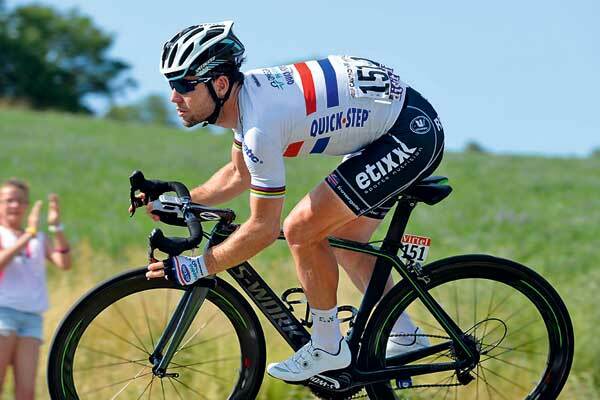 Cavendish was one of the best, flying past at 80kph despite the bumpy surface. It’s only when you see these guys descending that you appreciate the risks they take.